Gleaning is the practice of gathering fresh fruits or vegetables that are left after a farmer has already harvested a field. There are many reasons why good, healthy food might not get harvested by the farmer. One of the main reasons is that many supermarkets only want products that are all the same size, shape, and color. That means that any product that is a little too big, small, or that has a slightly different shape will be rejected by the supermarket. However, these products are still perfectly healthy and safe to eat. Some organizations will create events to bring volunteers out into the field to harvest these products so that they don't go to waste. 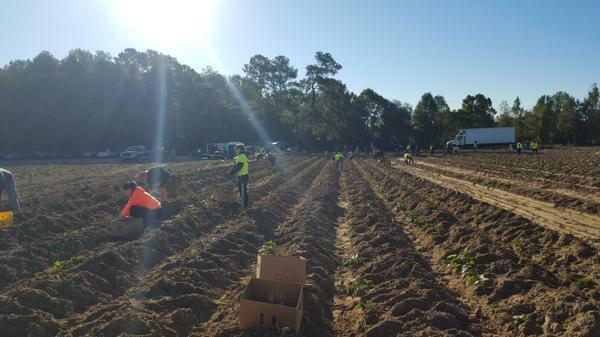 Gleaners in a sweetpotato field in Harnett County during an event organized by Harnett County 4-H (2015). Gleaned sweetpotatoes have not been cured. This means that unlike the sweetpotatoes you buy in the grocery store, these sweetpotatoes have not been treated to have a longer shelf life and thicker skin. These sweetpotatoes are fresh from the ground and will last about 2 weeks if stored properly. Store your sweetpotatoes in a cool, dark place or container that is well ventilated. DON’T REFRIGERATE YOUR SWEETPOTATOES! This will cause the sweetpotatoes to have a hard center. You can store your sweetpotatoes for longer in the freezer! Sweetpotatoes last 6-8 months when frozen. First, clean the sweetpotatoes under warm, running water. Next, boil them for 15 to 20 minutes. 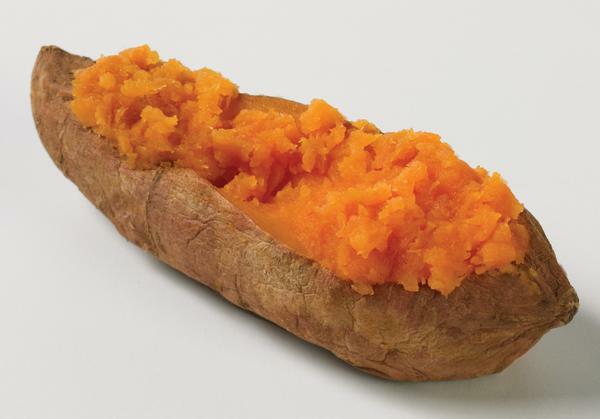 Once boiled, slice or mash the sweetpotatoes and then sprinkle them with lemon juice. Store the sweetpotatoes in an airtight container and then place them in the freezer. Sweetpotatoes still in the ground. What Do I Do with Freshly Gleaned Sweetpotatoes? Clean them! These sweetpotatoes just came out of the ground, so be sure to scrub them thoroughly under warm, running water to get off all the dirt. Tip: For easy cleaning, use a vegetable scrubber to help remove dirt. Since these sweetpotatoes have thinner skin, some may come off when you clean them. Do your sweetpotatoes have dark spots? Don’t worry! You can still eat them! Just cut away the dark spots and you can eat the undamaged areas. Try the delicious sweetpotato recipes provided here for healthy and affordable ideas on how to prepare your sweetpotatoes! Gleaned sweetpotato, fresh from the ground! You CAN eat the skins of the sweetpotato! They are very nutritious and delicious! Try to avoid sweetpotatoes that have worm holes, cuts or signs of visible injury. Tip: Small cuts and bruises on sweetpotatoes can be removed and the undamaged sections of the sweetpotatoes are okay to eat. Vitamin A! Important for eyesight and healthy skin. Vitamin C! Helps wounds heal and assists the body in fighting infections. Dietary Fiber! Helps regulate the digestive system and cholesterol. 2. Cut sweet potatoes into 1⁄2-inch thick lengthwise strips. Toss the potato strips with olive oil. 3. Coat a baking sheet with nonstick cooking spray or aluminum foil. Arrange potato strips in a single layer on the baking sheet. 4. Bake for 15 to 20 minutes or until potatoes are golden brown on the bottom. 5. Turn potatoes over and bake 15 to 20 minutes or until golden brown all over. 6. Sprinkle with salt and serve. 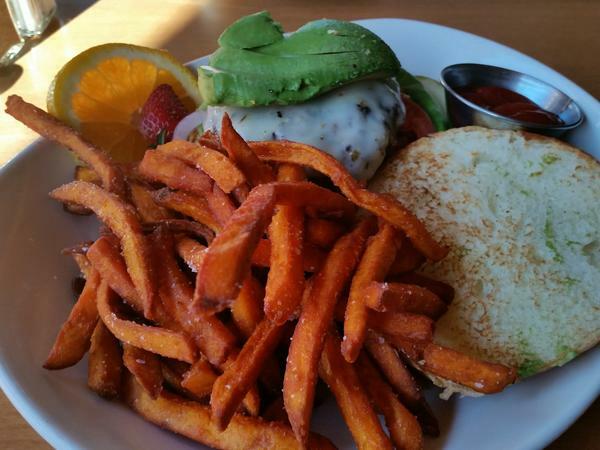 Sweetpotato fries make a sweet side dish. Poke sweetpotatoes with a fork, put them on a baking pan and bake in the oven at 375°F for 45 to 60 minutes. Poke sweetpotatoes with a fork. Put them on a paper towel and cook in microwave on high for 5 to 9 minutes (for two sweetpotatoes). Let sweetpotatoes stand for 5 minutes before serving. Baked sweetpotatoes are always a favorite. All Recipes Brought to You by EFNEP! EFNEP stands for the Expanded Food and Nutrition Education Program which provides nutrition, food safety and cooking skills education to low-income families. If you are interested in more information about EFNEP, such as how to join a class or bring a class to your church or community organization, contact your local Cooperative Extension office. You can also visit the EFNEP website for further information and resources. The Expanded Food and Nutrition Education Program- a great resource!